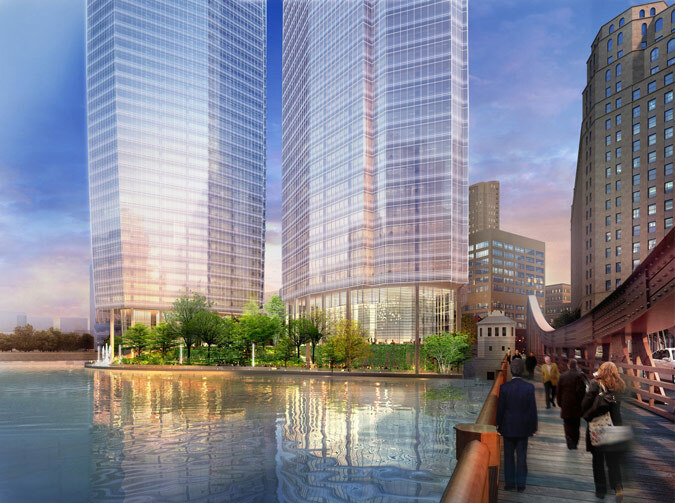 After a few administrative hurdles and several packed community meetings that aired downtown residents’ concerns, Chicago’s Wolf Point is poised to turn perhaps the most prominently underdeveloped piece of land in Chicago into a billion-dollar suite of skyscrapers along the Chicago River. Now that they have cleared the plan commission, developers Hines Interests and Magellan Development are ready to go as soon as they get the final permits in place. Construction will start with the bKL-designed, residential west tower (493 feet tall), which is expected to take 20 months. Towers two and three designed by Pelli Clarke Pelli (950 and 750 feet tall, respectively) will go up after that. The designs of those towers—which will contain office, retail, hotel, and parking space—are not set in stone and could change as the plan rolls out over the next few years. The points of contention raised by audience members at many meetings held since the project was unveiled included some typical complaints about blocking views, as well as opposing calls for more and less parking. Located near some CTA stops, the Pelli Clarke Pelli-designed complex dialed down its parking footprint somewhat—not enough for some transit enthusiasts, and too much for others who worried what the massive development’s impact could be on this dense corner of the Chicago River.